We're just going to come out and say it - Priyanka Chopra is (seemingly) living her best life yet. While the international superstar seems to have had quite the whirlwind of a month - what with multiple trips between Mumbai and New York - she seems to be coping with the jetlag just fine. How else do you explain her looking so fabulous all the time? Oh and that glowing skin - you would think someone who spends that much time on a plane would show some signs of dehydrated 'cabin skin'. Apparently, not when you're Priyanka Chopra. We wonder if it's all the cycling around NYC or just simply the fact that she is (allegedly) in love. Either way, we'll have what she's having. After her short visit to India once again over the last few days, Priyanka headed back to NYC yesterday. Priyanka seems to have gotten right back into action shortly after landing. She headed to the Hamptons for an event with her team. For the event, Priyanka chose to wear an orange satin finish pantsuit from Virgil Abloh's brand, Off-White. She was styled, as usual, by Mimi Cuttrell. Priyanka mentioned in the caption that she was having "the perfect summer night". Looking at her in this picture, we can see just how. Just a day prior to her visit to the Hamptons, Priyanka was in Mumbai where she celebrated her younger brother's birthday just before flying out. Nothing quite like partying it up with your fam - Priyanka Chopra is proof. And, of course, Priyanka never ceases to have fun even while sitting in for an extensive hair and makeup session. Priyanka posted a video of herself goofing around while makeup artist Mickey Contractor worked his magic on her. Not like she needs it, though. No offence, Mickey. 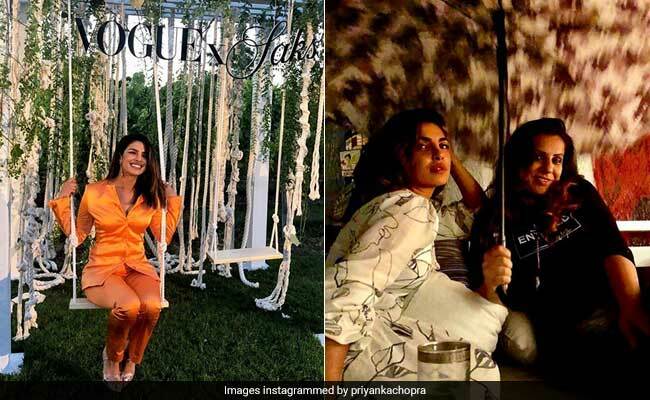 Priyanka Chopra's month definitely seems to have started on a high note, too, with all her outings with reported boyfriend, Nick Jonas. After Nick accompanied Priyanka to India, the two headed together for Nick's show in Brazil. Post that, the two were spotted walking the streets of NYC hand in hand while on an afternoon cycling date around the city. We have to say, in all these years of having witnessed Priyanka Chopra's effervescence and charm, we've never quite seen her glow this much. Like we said, we'll have what she's having.